London: Maurizio Sarri once claimed Gonzalo Higuain guarantees “certain death” for defenders — now the Chelsea manager must hope his decision to reunite with the Argentina striker breathes new life into his misfiring side. Higuain joined Chelsea on loan until the end of the season on Wednesday as Sarri tries to find the missing piece to a forward line desperately short of a cutting edge in his first year at Stamford Bridge. The 31-year-old enjoyed remarkable success in his one year playing for Sarri at Napoli and their reunion comes seven months after the Blues boss first tried to restore their working relationship. 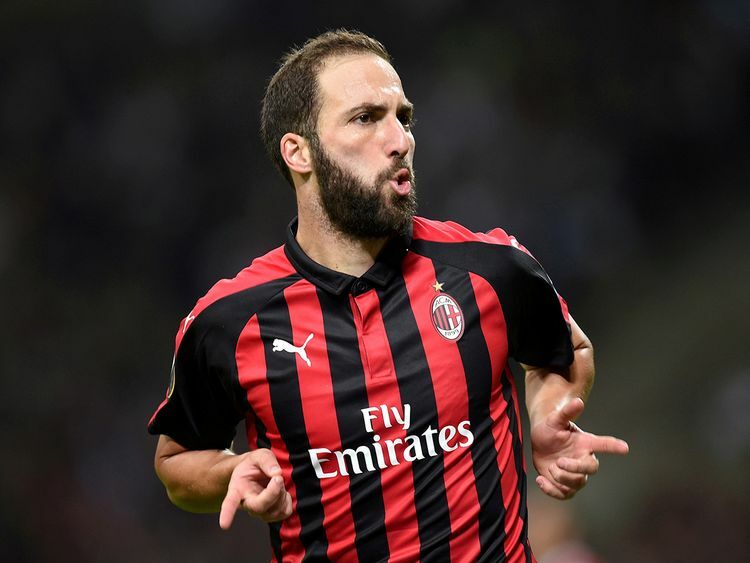 Higuain had been interested in joining Sarri at Chelsea when he left Juventus last year, but instead moved to AC Milan on loan because he felt more “loved” by the Italian club. That was a blow for Sarri, but he has finally secured the services of the man he believes brings physical presence and killer instinct in equal measure. “He is a phenomenon, a loose ball at Gonzalo’s feet means certain death for defenders,” Sarri said during their time together in Italy. Yet the muscular Higuain’s no-nonsense image is at odds with an introverted side to his personality. “Higuain is a very sensitive guy. He has been trying to keep up an image that doesn’t really go with his real character,” Sarri said. Despite being one of the world’s most prolific strikers over the past decade, Higuain has had plenty of detractors and was criticised for missing glaring chances in Argentina’s defeat to Germany in the 2014 World Cup final and in the 2015 and 2016 Copa America final losses against Chile. However, football is in Higuain’s blood. His father Jorge played for Boca Juniors and River Plate before becoming a lawyer, while his elder brother Federico represents Major League Soccer side Columbus Crew. “From my father, I inherited mental strength, malice and the way to annoy defenders,” Higuain said. He joined Spanish giants Real Madrid from River Plate at the age of just 19 in December 2006. Three La Liga titles and an impressive 122 goals in 264 games followed, but Higuain was much maligned for his record in big Champions League games and left without winning the European Cup at Real. He eventually became the odd man out at the Bernabeu, with Cristiano Ronaldo preferring Karim Benzema as his strike partner. A move to Naples in 2013 proved fertile ground for Higuain, who netted 35 league goals in his first two seasons in Serie A. But it was once Sarri arrived as Napoli boss that Higuain enjoyed his most memorable campaign, in 2015-16. Aware that Higuain was a top-class talent yet to completely fulfil his potential, Sarri went on work on the psychology of his target man. “What did I say to Higuain? I told him he was too lazy and if he didn’t change his attitude he’d never become the best centre-forward in the world.” Sarri said. Anointing Higuain as the man to lead his attack as the spearhead of his 4-3-3 formation, Sarri’s straight talking reaped instant rewards as he shattered the 66-year-old Serie A record for goals scored in a single season with 36 in 35 games. “I thank Maurizio Sarri, absolutely. He helped me so much, he always told me what I had to do in order to improve and I always listened,” said Higuain, who has 31 goals in 75 appearances for Argentina. That was his only campaign with Sarri as Juventus activated the release clause in Higuain’s contract to sign him in July 2016. He struck 55 times in 105 games for Juventus, won two Serie A titles and reached the Champions League final in 2017. But that European showpiece ended in defeat against his old club as Ronaldo scored twice in a 4-1 Real win and his time in Turin would be curtailed by the spectre of the Portuguese once again. When Ronaldo swapped Madrid for Juventus before the start of this season, Higuain was the fall guy. Complaining about being “kicked out” at the time, Higuain will be the unwitting beneficiary of that move if his Sarri reunion pays off.